Hickman is a community of just over 1,000 surrounded by the beauty of several Salt Valley recreational lakes including Wagon Train Lake, Stagecoach Lake, and Blue Stem Lake. Each of these lakes offer boating, swimming, camping, picnicking, and fishing areas. Located 12 miles south of the state capitol in Lincoln, Nebraska, Hickman is close enough for all the larger city amenities, but maintains its small town atmosphere. One of the early settlers, Rev. C. H. Heckman, lived near Salt Creek. As time went on, he purchased the adjoining 80 acres which later became the town. A post office, established in 1868 south of the present city, was given the name "South Pass." When the Atchison & Nebraska Railroad built its line from Rulo to Lincoln, Rev. Heckman was successful in procuring a station and the post office was moved to its present location. A plat was filed by Heckman and Samuel Egger in Lancaster. However, in recording the procedures, the spelling of the name was recorded as "Hickman." It has remained so to this day. The yearly town celebration, Hickman Hayday, continues a long tradition. The South Lancaster County Fair was held in the Hickman Park in 1894 and a yearly celebration of some type has been held since the first Old Settlers Picnic in 1899. The Hickman of today is very different from the settlement that was established in 1871, however, it still has a congenial community spirit. While many of our residents are descendants of original homesteaders, there are also many new people who have discovered our town. Many of them are employed in Lincoln, but enjoy the small-town atmosphere we have to offer. New homes are being built every year and this makes the future look as interesting and vital as the past for our town. Wagon Train SRA encompasses some 745 acres of land surrounding a 315-acre lake. 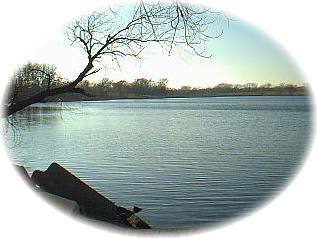 This popular area provides year-round angling for largemouth bass, northern pike, walleye and bluegill among others. Anglers especially enjoy Bluestem's 742-acre state recreation area. The 325-acre lake offers diverse action for anglers of all abilities. Opportunity awaits to try for largemouth bass, bluegill, channel catfish, walleye, northern pike and wiper among others. Main City Park - The City Park includes three ballfields, playgrounds, two picnic shelters, dirt bike trail, tennis, basketball, and sand volleyball courts. Campsites with electric hookups rent for $5.00 per night.